map links shows your current position on the map. You access your current position (latitude, longitude, altitude, etc.) through variables to create an URL to open other apps or websites and pass your location information. 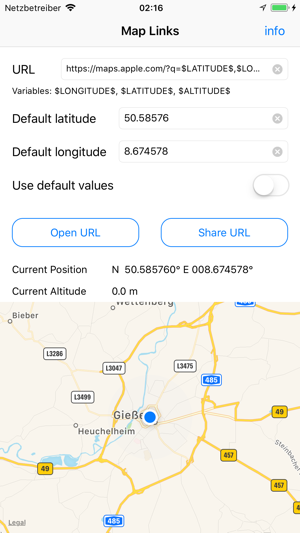 There is also an option to use default location values. You can also create text with your position information and copy/share it. Please mind: GPS may not work correct inside buildings. This app does not collect/analyse any user or usage data. The user has full responsibility for sharing his location information.